NASA's Sample Return Challenge aims to make robots capable of navigating and retrieving samples by themselves. 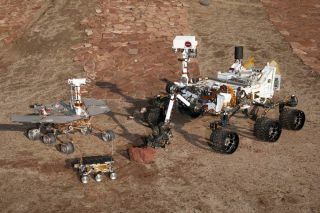 This image shows the space agency's past rovers (smallest to largest): Sojourner, Mars Exploration Rover and Curiosity. Today's robots on Mars remain invisibly tethered to human commands millions of miles away, but NASA hopes to unleash the next generation of robots sent to bring back Martian samples. An upcoming competition hosted by the U.S. agency offers $1.5 million in prizes for robotic space explorers capable of roaming alien planets and collecting samples all by themselves. Competing robots must retrieve samples such as colored tennis balls, blocks of aluminum or rocks spread across a landscape filled with soft soils, rocks, trees and bodies of water — all without human guidance or GPS navigation to simulate the challenges of exploring other planets. The contest is scheduled to take place at the Worcester Polytechnic Institute in Worcester, Mass., from today through Sunday (June 15 – 17). "Rovers that might have to do this someday on Mars or another planet don't have the luxury of operating with human guidance," said Mason Peck, NASA's chief technologist. Autonomous robots would represent a huge step beyond past or current NASA robots such as the Spirit and Opportunity rovers. That older generation of Mars rovers could only navigate on its own across short distances between artificial "waypoints" set by human handlers — a capability also possessed by NASA's car-size Curiosity rover headed to Mars. "There really is not precedent for a lot of this technology in space," Peck told InnovationNewsDaily. "Being able to autonomously grab a rock sample has never been done on a mission." Artist concept of an autonomous sampling robot. The six teams remaining from the final 11 chosen for the competition must show their robots can autonomously navigate and retrieve a hidden sample within 15 minutes to win a Level-1 prize of up to $5,000 per team (split from a prize purse of $50,000). The robots must also remain autonomous at all times and retrieve many other samples within a two-hour time limit to win the much bigger Level-2 prize — up to $1.5 million split among winning teams based on point score. That's a winning solution for NASA, because any technologies arising from the Sample Return Robot Challenge could benefit the next generation of NASA's robot explorers. Such robots could prove especially useful for the long-planned Mars sample return missions that would help definitively test for past or current presence of Martian life. Second, the $2 million Nano-Satellite Launch Challenge looks to boost space access by asking competitors to launch a tiny satellite into orbit at least two times in one week. NASA has run similar prize competitions for years to get the most bang for its buck from a relatively modest budget — competitors usually spend much more money combined than what the U.S. space agency offers up as the prize. The competitions also attract talent from "nontraditional problem-solvers" such as students or private innovators who may not otherwise get NASA contracts through official channels. "What we're going toward primarily is putting out prizes in series with technology development goals," Peck said. "We firmly have in mind NASA's future for exploring the asteroids and Mars."